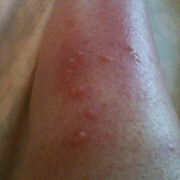 I got several bug bites just below and to the left of my left knee last Wednesday (5 days ago). 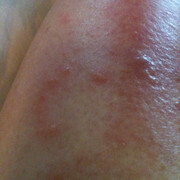 I counted 11 tiny blisters where whatever it was had got me (Greenhead Fly? Horse Fly? Spider?). After initial swelling and blisters which oozed a little, the blistered dried up and swelling decreased, but left a large area of red skin. It's still slightly warm to the touch, and despite the fact that it looks worse now, it's actually not oozing or as swollen or red. My left ankle is also swollen, but it's been humid and I also think I have (yet again!!!) the beginning of a UTI, and swollen left foot is one of the symptoms. I can't feel it, of course, but suspect it would probably hurt like hell if I could. 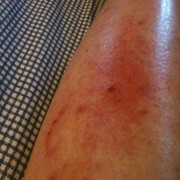 I'm worried about skin breakdown, obviously, and am currently trying to get into my docs today for her to have a look. But, it's Monday in a holiday resort. Odds are not good. In the meantime I continue to slather it with a herbal salve containing chaparell. comfrey, and all sorts of other deliciously smelling and good -for-the-skin concoctions. I go the herbal route. Before SCI, I made a marvelous discovery about Green Black Walnut Hull Tincture. My house was haviing electrical work done by an electrician in the summertime. He worked at night due to the heat, and also because he had a full-time day job. That left me in the dark, with the electrical circuits turned off, the doors open for air, and being accompanied by a cloud of mosquitos. Taking small swigs of Green Black Walnut Hull Tincture took away the maddening itch. The bites kept coming, but those small sips of the tincture helped me survive the renovation. Later that summer, a yellow jacket saw me beside my back patio and dove for my finger. He was quick. Must have been in fight training or was a newbie gangster doing his initiation... He really bit that finger...it was like electric shock with ensuing swelling and burning agony. I ran for my Green Black Walnut Hull Tincture, and within seconds of drinking it, the most unbearable symptoms of the bite were assuaged. The bite was still there but the panic, escalating pain, and undue swelling didn't happen. I see the tincture as my own "snakebite antidote", though I've never been bitten by an actual snake. Black Walnut Hull Tincture, by nature, contains iodine. With your Hashimoto's condition, Jaylock, you need to know this. But this is what I take for bug bites,...also my zapper for any inflammation. And besides drinking the tincture, I apply it externally. Funny, Mike! Vintage, I ordered some of the tincture. You're a gold mine of information. Thank you. It looks like amazing stuff and worth a try for other things (you know me and experimenting). I have a 2:30 drs app. with a substutute doc, so I'll let you know what he says. Vintage, you should start up an alternative therapy business. You would make a fortune with your knowledge. Maybe you should write a little book or pamphlet to sell to people. 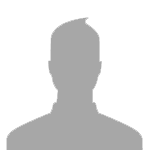 But you are doing the right thing by imparting your valuable knowledge free and for the benefit of all. Excellent stuff. It looks a little like cellulitis, which I have gotten from bug bites. You might try putting honey on it - even if not manuka honey, it's a pretty good antibacterial. Another thing is to consider is that if you're getting a UTI, your body may be all hyped up and inflamed and over-reacting - mine does this - and a whole lot of intervention may do more harm than good. Try tracing the outline of the inflamed swollen area and time and date it and then re-outline every 12 hours - it'll give you a great visual of which way things are going. Spider? or family of spiders? Will be interesting to hear what the doc thinks. Okay, so an horrendous morning of AD, which may or may not have to do with the bite, but here's what happened. Saw Laura, a nice Physician Assistant, who thinks it is a Greenhead Fly bite, which are very nasty and painful (usually), and which often pass on bacterial infection. The bites themselves (most people only get one and swat the bloody thing right away because it's so painful, but...) are healing nicely, she thinks (and annev308, I did put Manuka honey on first thing when I noticed the blisters - good stuff, thanks for the tip), but her concern was the swelling in the leg and ankle, and the reddened skin surrounding the bites. She prescribed a topical antibiotic cream (you were right, mikeq,) and because the dip also tested positive for UTI, also prescribed Nitrofurant, which should help both infections. She's culturing the sample to make sure and I'll know Wednesday, but with the symptoms and the dip, antibiotics right now seem like a good idea. Started the antibiotics last night, but the cream prescription got lost in cyberspace and I wasn't able to fill it. Most mornings I wake up with AD (BP around high 140s to low 150s over high 80s) which continues until I've attempted to empty my bowels. Even on days when my routine is unsuccessful, my BP still goes down about 30 minutes after the routine. I felt good when I woke this morning - none of the usual snotty nose, blurred vision, feeling upset symptoms I normally have first thing, No usual stomach cramps either (I'm still trying to find a GI doc who can help me figure all this out by-the-way). I figured it was just one of those good days I get sometimes. My bowel routine was completely unsuccessful, though. Nothing. And it has been very good in the recent weeks. But, I still felt good after a shower and transferring back into bed. I had some rectal pain (fissure, maybe?) but that's not unusual either. Despite the lack of usual AD symptoms, though, something just didn't feel right so I checked my BP. WTF!! 175/101! Feet over the side of the bed, quick hit of weed (what the hell), and magnesium spray while we find the Nitroglycerine spray in my bag. BP now 180/114. A quick hit of Nitro and five minutes later it's back down to 156/97. It's slowly come back down, and although still in the 140's over 80's I'm no longer contemplating calling 911. I just can't face the nightmare of the local hospital if I can help it. They have absolutely no clue. I'm thinking that maybe annev308 is right, and that my immune system is just in overdrive right now. From the bug bite maybe? My plan, such that it is, is to take it easy today and see what happens with the cream (still waiting. They sent t to the wrong pharmacy) and antibiotics. In terms of medical professional, I honestly don't know where to turn anymore so I'm pretty much on my own. Thanks for your comments and input. I'll let you know how things progress. My leg this morning is about the same. The main bite looks a little raised, as though it may be coming to a head, but I'm not sure. We'll see. I'm so glad you made it through that Jaylock. Whew! Are they sure it was the fly? 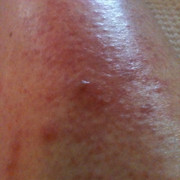 Fire ant stings look very similar. I'm glad you're still with us, Jaylock. I'm the same about getting big bites and welts that I didn't feel occurring. And if it's on the back of my calf, I can't possibly see what insect bit me, or shoo him away. My blood pressure monitor was sent to my house on the day that I was supposed to be released from the nursing home two years ago, then they didn't release me, and someone stole the little device from my porch. Now I'm seeing how nice it would be to have one. I watched a show on public tv tonight - Hunting the nightmare bacteria. It gave two case histories of people who got a superbug that antibiotics couldn't kill. I love alternative therapy! Oh dear, Jalock. I am very familiar with the sinking feeling you get when your blood pressure is abnormally high. I regularly experience a sensation of "not feeling right". You know your blood pressure is high but you don't think it's too bad, then you see the reading on the gauge and you go into overdrive. The thing is you've got to find out what's causing the blood pressure to rise in the first place. I know what you mean about going to hospital. Unless it's a spinal unit, they are not the best places to be. The UTI is my main bet. Bladder infections are guaranteed to send my blood-pressure through the roof. Nitrofurantoin is good for E. coli bacteria, which is generally responsible for urinary infections. It is unlikely to kill the bacteria that has infected your skin. It's a rollercoaster ride. Never a dull moment with spinal injury. My BP this morning was 56/38. By the time I come down from the shed at lunchtime, the systolic will be around ninety-five, maybe 105. It's the diastolic that does the harm, the bottom reading. I like mine to be no higher than sixty and no lower than forty-five. Who knows when dysreflexia will strike? When my GP asks how my blood pressure is, I say take your pick. He knows it can vary dramatically. Enjoy the weed, by the way. I've got some leaves drying in the conservatory. I had to look up "conservatory", Mikeq. Lol. a college for the study of classical music or other arts. "a teaching job at the conservatory"
a room with a glass roof and walls, attached to a house at one side and used as a greenhouse or a sun parlor. The saga continues. News from the doctor this morning that my urine culture is negative, so to stop taking the oral antibiotics and continue with the ointment. That leaves either the bite and/or constipation as the cause of AD, which continued all day yesterday. Since my BP was 163/94 when I woke this morning, and went down to 138/78 after a successful bowel routine (warm prune juice with butter yesterday), I'd say it was constipation. I'm just not sure what caused that. The swelling in my leg and ankle around the bite has also gone down and is almost back to normal, but the skin surrounding the main bite is still very inflamed. I talked to an AB friend of mine yesterday who had an almost identical reaction to a Greenhead Fly bite (just one) on her leg three years ago. She told me the pain was absolutely excruciating, and when she finally went to her doctor after getting back off holiday he prescribed oral Ceflex and an antibiotic cream, and told her is was a MRSA infection. It took a long time to heal, apparently. I think MRSA one of the resistant strains you mention, vintage, and you're right mikeq, Nitrofurant will have no effect on skin infections I found out. Mine is probably a slight case of cellulitis, considering I always have a bad reaction to any bug bite, even mosquitoes, in addition to the painful bites (which of course I can't 'feel'). kilg0retr0ut, mentioned Fire Ants. I'm not sure which is worse, the Greenhead or Fire Ants but before my sci, living in Texas and Florida, Fire Ants were the bain of my life. I was absolutely paranoid any time I saw a bump in the sand. Those things would seek me out and when they got me (which they inevitably did) they'd leave me with a blister the size of a quarter wherever they bit, and a nasty swelling in the area. I can't count the number of times I've had to run around without one shoe due to a swollen Fire Ant bite. It was so painful. I though I'd escape nasty bugs in New England but here we have the dreaded Greenhead and ticks. Here's hoping things continue to improve (at least I think that's what they're doing). Thanks for the input everyone.